The Toronto District School Board is proud to announce that during this May’s Jewish Heritage Month, we will be hosting "Anne Frank - A History For Today." 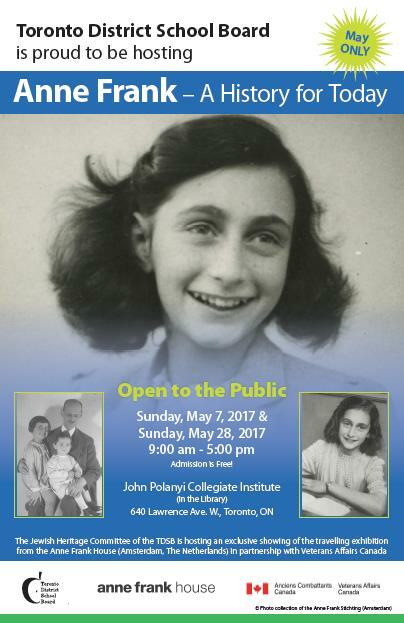 Originally from the Anne Frank Museum in Amsterdam, this international exhibit will be housed at John Polanyi Collegiate Institute for the entire month of May and will include opportunities for not only TDSB students to visit, but members of the public as well. This Exhibit has 37 panels and tells the story of Anne Frank set against the background of the Holocaust. It makes use of images from the Frank family and quotations from Anne Frank’s diary. Each of the panels displays information about the most important developments of the time such as the rise of National Socialism. Thanks to a partnership with Veterans Affairs Canada that recognized the 70th anniversary of the liberation of The Netherlands by the Canadian Army, the exhibit is fully bilingual and has additional panels on the Canadian contribution to the Second World War. There will also be additional artifacts present that are usually reserved for museum viewing only. Given this important piece if history, we are excited that the TDSB is not only able to offer this to school groups, but to the general public as well. The exhibit will be open free to the public for two days only: Sunday, May 7 and Sunday, May 28 from 9 a.m. to 5 p.m. Please click the poster to the right for more information.